Yum. These look like a great Saturday breakfast! Bread is one kind of food that ever since I learnt to make it, I’ve never failed. I am not saying that I have mastered making it, just that the result is always good. Also, I found out that homemade bread lasts longer in room temperature than the store bought bread. That’s why homemade cooking is always healthier than eating out, I believe this. This is the first time I baked Paczki and I just love their taste. 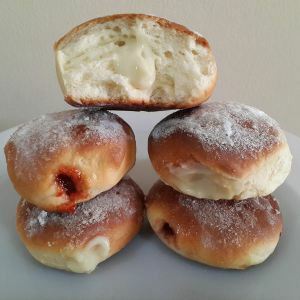 Paczki are Polish doughnuts . They are actually fried doughnuts but they can be oven baked as well. I did the oven baked ones. Traditionally they are filled with strawberry jam but again, you may fill them with any fillings you like. I went with vanilla custard and strawberry jam.